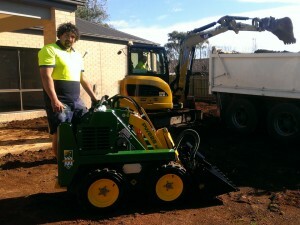 As we install fiberglass swimming pools in domestic backyards, we find the stand on Kanga Loader machine to be more manageable in tight locations, than a sit down skid steer machine. At Leisure Pools, we chose Kanga Loaders over the opposition because of the service location available & the more robust construction of the machine in general. The PW628 machine is perfect for our application being used to blend our stabilized back-fill using the 4 in 1 bucket & is very maneuverable around the work site, it is easily transported by trailer from job to job. The Kanga PW628 makes the blending & back-filling of an average 20 Tonnes of materials per swimming pool, less labor intensive & time consuming than the alternative methods. 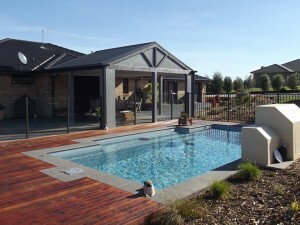 It also gives our team the ability to level & clean up the site keeping our customers happier with a tidy construction surround of their new backyard pool.